On 26 February 2018, the Unrepresented Nations and Peoples Organization (UNPO), together with the Uyghur Human Rights Project (UHRP), the Uyghur American Association and the World Uyghur Congress (WUC) organised a conference entitled “Uyghur Religious Freedom and Cultural Values Under Siege”. 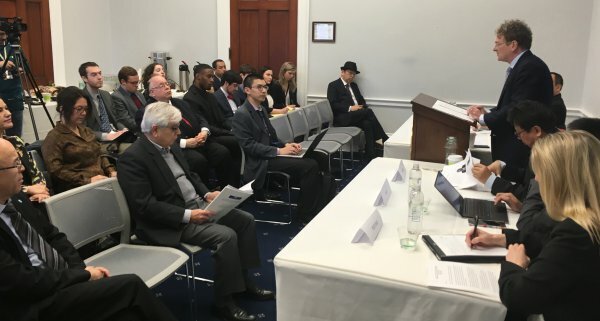 Taking place at the US Congress, the event brought together academics, human rights activists and members of the Uyghur diaspora to discuss the current situation on the ground in East Turkestan. High-level panellists included Sean Roberts (George Washington University), Mr. Teng Biao (University of Politics and Law in Beijing, visiting scholar at New York University), Mr Alim Seytoff (Director of RFA Uyghur Service), Tina L. Mufford (United States Commission on International Religious Freedom), Chen Pokong (Chinese writer, critic and democracy movement activist) and Ms Nicole Morgret (Uyghur Human Rights Project). To open the conference, the Director of the Uyghur Human Rights Project, Omer Kanat, welcomed the audience and the panellists and gave an overview of the current situation in East Turkestan, highlighting the urgent need to bring the grave situation Uyghurs find themselves in due to Chinese oppression on the international agenda. Mr Kanat stressed the severity of the current situation, pointing out that a lack of decisive action by the international community would encourage the Chinese government to continue or even increase the suppression of Uyghur people. Sean Roberts, Director of the International Development Studies Program at George Washington University, opened the panel discussion by elaborating on China’s excessive use of so-called “re-education” camps, which ultimately serve as a tool to silence Uyghur dissidents who are subjected to gross human rights violations while being detained in these institutions. Mr Roberts pointed out that there is no substantial international attention given to this and expressed hope that the US government would take a lead on this to, at the very least, pressure the Chinese government into giving an independent delegation access to these camps. He then continued by discussing how the Chinese government plays the “terrorism card” in order to discredit the legitimacy of the Uyghurs’ struggle for respect of their most basic human rights. The second talk by human rights lawyer and activist Teng Biao then looked at how the Chinese government deliberately targets and silences activists and intellectuals who try to raise the Uyghurs’ plight, often arbitrarily arresting and sentencing them to life-long prison sentences. Mr Biao urged the international community to pay closer attention to these numerous cases of prisoners of conscience in China, pointing out that peaceful activists such as Professor Ilham Tohti should be awarded for their courageous efforts to promote inter-ethnic understanding, rather than being forgotten. Following the instructive speech of Mr Biao, the floor was given to Alim Seytoff, Director of Radio Free Asia’s Uyghur Service. Mr Seytoff described in detail how sophisticated and far-reaching the surveillance state in East Turkestan has become, with a system in place that tracks the movement and communication of Uyghurs throughout every aspect of daily life. According to Mr Seytoff, the “high-tech police state” that has been put in place by the Chinese government amounts to a quasi-military occupation of the so-called Xinjiang Autonomous Region. In her talk, Tina L. Mufford, Senior Policy Analyst at the US Commission on International Religious Freedom (USCIRF), then gave an in-depth overview of the state of religious freedom in East Turkestan. She pointed out that, tragically, the systematic repression of Uyghurs’ religious freedoms is hardly a recent development, but rather has a long history, as evidenced by USCIRF’s coverage of this issue ever since it’s foundation in 1998. Ms Mufford pointed out several ways that the US government could and should get involved in this issue, among them continuously raising the state of religious freedoms in all exchanges the US government and its institutions have with their Chinese counterparts; taking steps against individual perpetrators, for instance by making use of tools such as the Magnitsky Act; and highlighting the cases of individual prisoners of conscience to thereby raise awareness for the issue as a whole. The following talk by former political prisoner and pro-democracy activist Chen Pokong shed light on what ramifications the systematic suppression of religious and cultural freedoms in East Turkestan potentially could have for the rest of China. Mr Pokong pointed out that the region can be regarded as a testing ground for the use of surveillance and the technologically advanced restriction of personal freedoms whose techniques – if left unchecked – could be used to control all people in China in the future. The event’s last panel talk by UHRP Project Coordinator Nicole Morgret looked at the alarming rate at which China’s grip on peaceful minority activists extends beyond the borders of the People’s Republic. By deploying intimidation tactics, often using relatives of Uyghurs abroad as leverage, Beijing seeks to gather information from the Uyghur diaspora or, in many cases, to force them to return to China. According to Ms Morgret, this strategy of silencing Uyghur voices abroad is compounded by manipulating and influencing international mechanisms and institutions, such as Interpol or the United Nations, to discredit the most prominent leaders of the Uyghur human rights movement abroad. A fruitful discussion with the audience following the official programme brought this important conference to a close and allowed political decision-makers, researchers and academics, as well as representatives from the media to direct questions at the panellists.